Bayou Repairs. Sales & Service. Patterson, La. 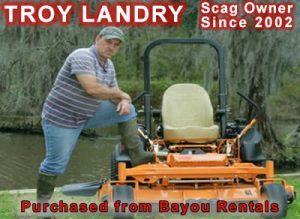 Stop in and TEST DRIVE a Scag Today!! We carry a full line of quality outdoor power equipment for home, landscape professional, or contractor use. We are an Authorized Dealer & Repair Shop for : Boss Drives, Scag Mowers, Go-Devils, Surface Drives and Stihl Power Equipment. Cat pumps, Briggs & Stratton Generators, Honda and Ingersoll Mowers. Briggs & Stratton, Kohler, Kawasaki and Honda Engines. MUD MOTOR UPGRADES. 35+ & 35++ . ++ Meaning * More Power . WE CAN DYNO RUN HORIZONTAL & VERTICAL ENGINES ! Service is what it’s all about. Quality service, done right the first time. We offer the highest quality service using only OEM parts for your Residential and Commercial Equipment. We are staffed with 4 highly trained & certified service techs and 3 friendly & knowledgeable sales staff personnel. 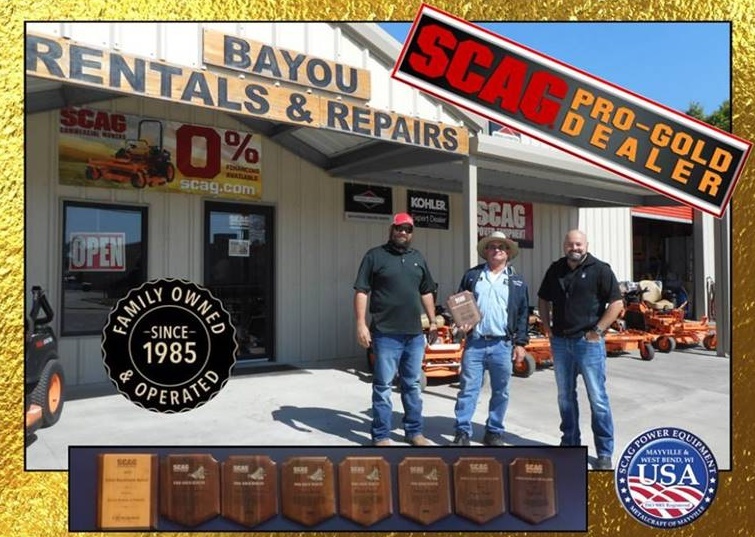 We specialize in Scag Mowers, both in sales and service since 1995. 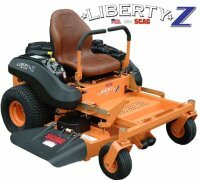 Over 20 years dedicated to “Simply the Best” Zero Turn Mower on the market today. Stock & Modified 35HP engines are in stock and ready to install on your mud motor / shallow water frames. Lawn Mowers: Self Propel, Push, Riding & Zero Turn – Go Devils, Surface Drives, Boss Drives, Pressure Washers, Concrete Cleaners, Generators, Tillers, Chainsaws, Brush Cutters, Trimmers, Water Pumps, Edgers, it’s all here. Stop in and visit us soon. 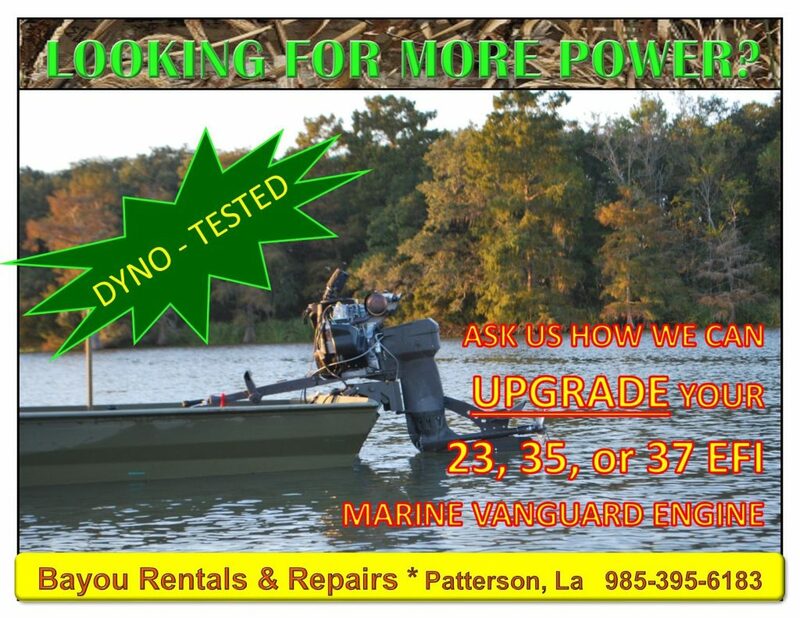 Serving Morgan City, Berwick, Patterson, Amelia, Franklin, Pierre Part, Bell River, Houma, Thibodaux, Jeanerette, New Iberia, Gray, Broussard, Lafayette, Raceland, Carencro, Centerville, St Martin Ville, Bel Rose, Gonzales, Baldwin, Napoleonville, Gibson, Schriever, Charenton, Labadiville, Chackbay, Plaquemine, Lockport, Stephensville, Paincourtville, Belle Rose, Donaldsonville, Abbeville and South Louisiana. Parishes: St Mary, St Martin, Terrebonne, Lafourche, Assumption, Iberia, Lafayette, Acadia, Vermilion, Ascension, St Landry, St James, East Baton Rouge and Iberville.